Salary is commensurate with experience. Benefits include 4 paid holidays, retirement matching program, reimbursement of business travel and professional development. 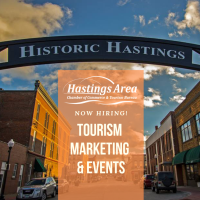 Develop strategies to increase visitor frequency and duration-of-stay in the Hastings area in coordination with Hastings Tourism Board of Advisors and local partners. Coordinate all tourism advertising, press releases and content for travel writers. Manage social media sites for Visit Hastings MN and Rivertown Days. Coordinate engaging social media campaigns to drive tourism traffic to the Hastings Area. Management of the Hastings Tourism Bureau website. Management of the Hastings Tourism Bureau budget. Create and manage distribution of Visit Hastings MN tourism brochures. Assist in the planning and implementation of Rivertown Days and the Chamber Annual Meeting and Awards Dinner. Must be able to work the third full weekend in July. Serve as the primary liaison with Explore Minnesota Tourism. Prepare grant applications for tourism product development. General administrative tasks including answering the phone, providing information to visitors and mailing travel brochures. Other Chamber projects as needed determined by the Chamber President.